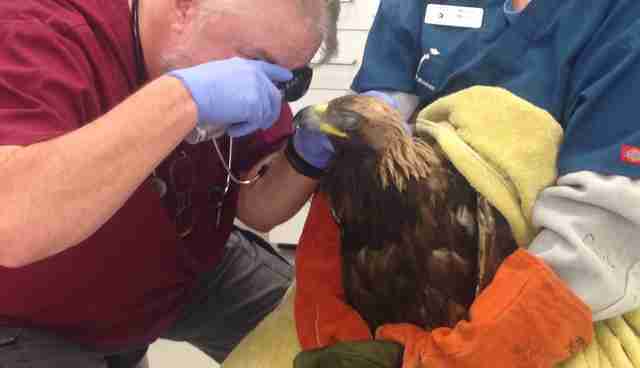 A California wildlife rescue recently took in an unusual patient: a rare golden eagle. 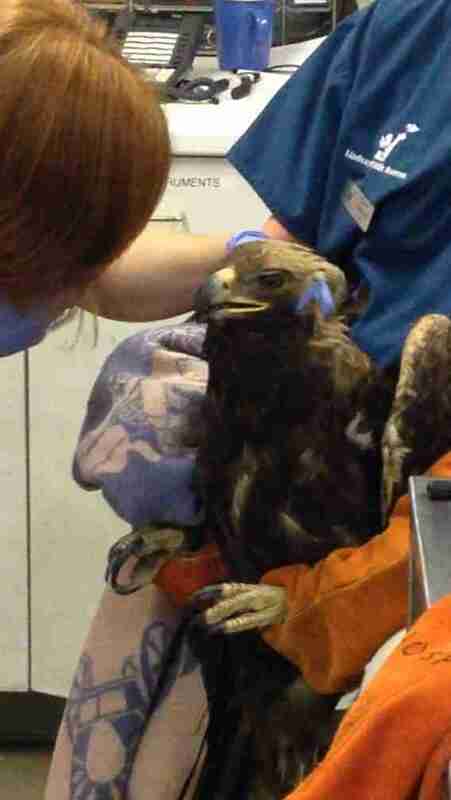 A group of firefighters found the stunning raptor on Friday when the 11-pound bird decided to rest on the sidewalk outside their station. "It looked like she was pretty tired, and then we tried to catch it and [she] landed on the ledge of the window but couldn't fly more than 50 feet," firefighter Chris Connley said. "It didn't look right." 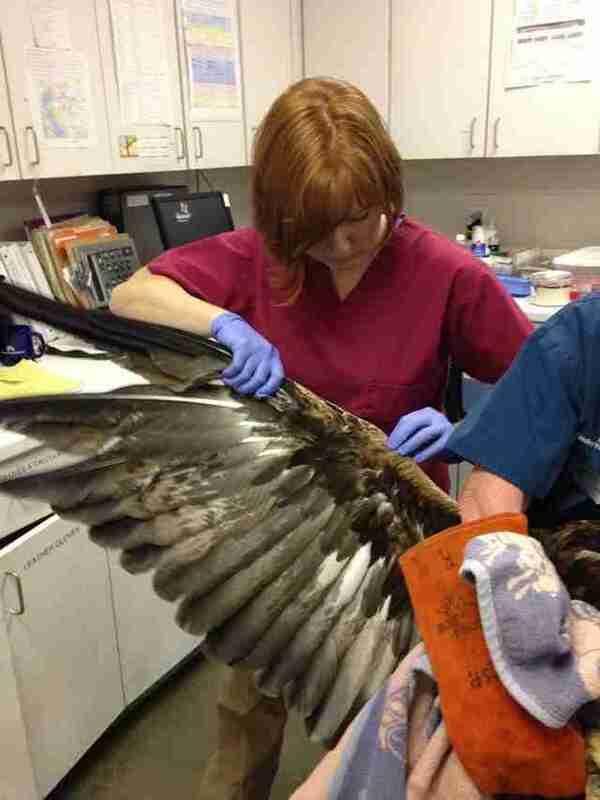 Her rescuers rushed her to the Lindsay Wildlife Rehabilitation Center in Walnut Creek, California, where vets discovered the weak bird was dehydrated and suffering from head trauma. She also had possible rodenticide toxicity, which happens when predators eat mice contaminated with rodent poison. 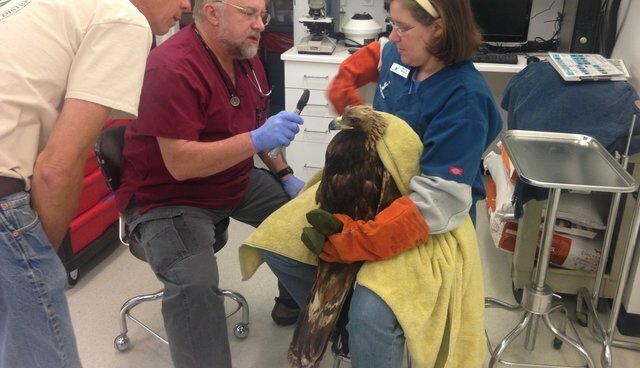 Despite her weakened state, photos show the fierce bird looking quite ruffled as the veterinary team examines her. 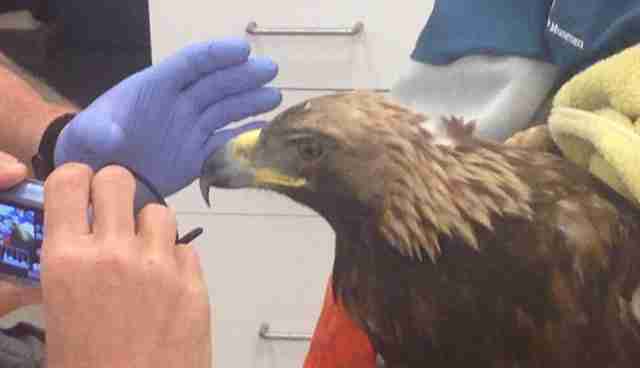 The eagle also brought an addition with her - a GPS backpack. 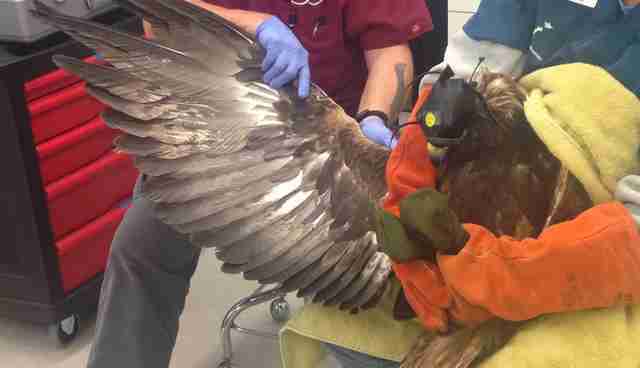 She was one of a group of eagles being tracked in a study about the effect of the Altamont Pass Wind Farms. 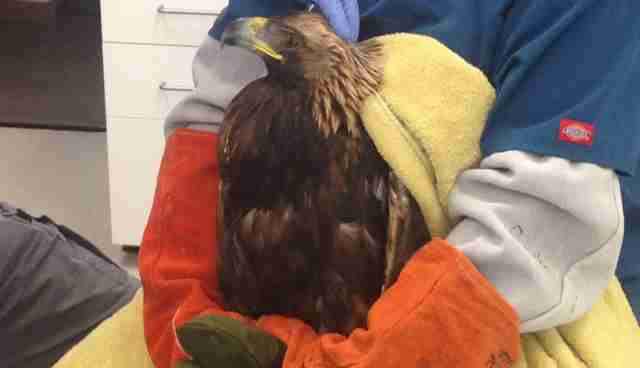 The center said in a press release that, of the eight or so golden eagles they see per year, most of them arrive having been badly injured by the turbines, and are too far gone to save. Though the large birds aren't endangered, they're protected under The Bald and Golden Eagle Protection Act. Wind turbines are a known threat to birds, and the Altamont Pass turbines kill thousands of birds and bats per year. 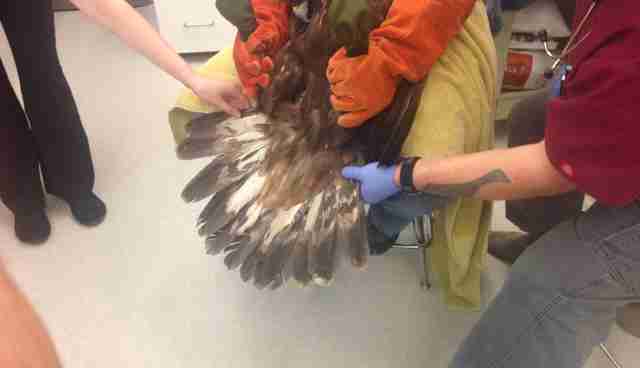 Fortunately this eagle could have a luckier fate than the others treated by the center. The veterinary team is cautiously optimistic about her recovery, noting that the most important thing is for her to fully regain her neurological functions since she currently has limited sight in one eye. 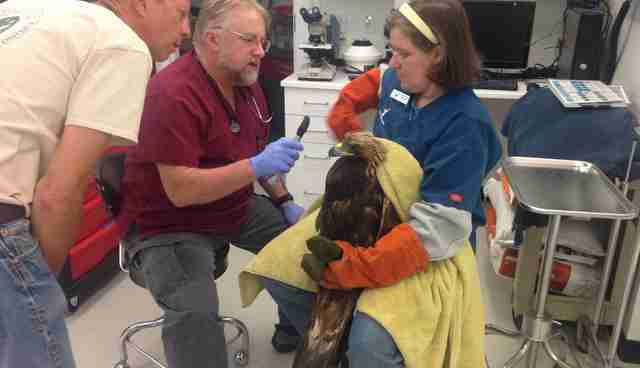 "The eagle was noticeably perkier after three days of intensive care," veterinarian Lana Krol said. 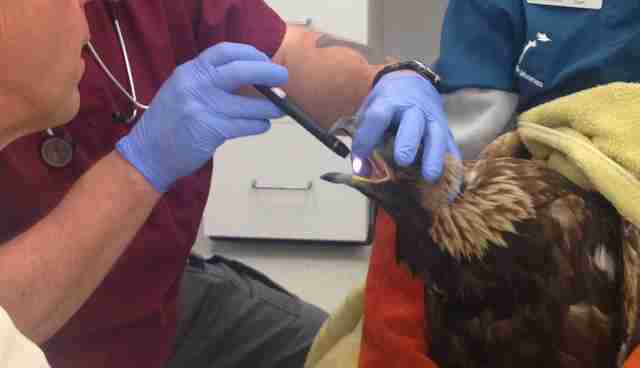 "Our goal now is to rehabilitate the bird back to her usual feisty self." You can watch a video of her checkup below.